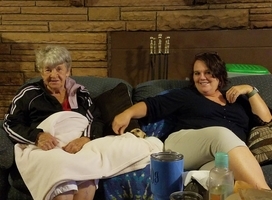 Provide comfort for the family of Mildred Dodson with a meaningful gesture of sympathy. Mildred Inez Dodson, 85, of Central, went to be with her Lord and Savior Jesus Christ on Sunday, February 3rd, 2019. She was the daughter of the late, Leroy and Nina Pilgrim. 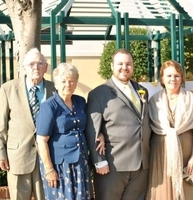 She is survived by her loving husband, Herbert Dodson; her devoted children, Linn Alexander (Steve), Steve Dodson, Brian Dodson, Joe Dodson (Leigh), Joye Maw (Jimmy); her grandchildren, Darrell Cartee, Camille Cartee, Stephanie Staton, Kala Dodson, Whitney Dodson, Jo Leigh Durham, Dustin Duncan, Kyle Duncan, Kevin Duncan, Allen Holladay, Merissa Maw, Ashlee Maw-Hayes, Katlynne Hayes, and Eddie Hayes; 9 great grandchildren; her fur babies, Rocky and Penny; and her siblings, Junior Pilgrim (Louise), Jerry Pilgrim (Elaine), Pauline Hall (David), and JD Pilgrim (Carolyn). 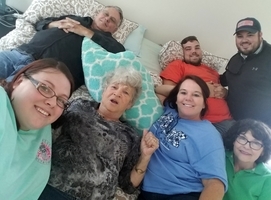 She was preceded in passing by her daughter, Wanda Sue Thomas; grandsons, Brad Alexander and Jason Alexander; and her siblings, Edith Cartee, Hazel Rampey, Furman Pilgrim, David Pilgrim, Katie Maxey, Billy Joe Pilgrim, Christine Pilgrim, Donald Lee Pilgrim, and Ovaline Marcus. Mildred first and foremost loved the Lord. She was a life long member of Faith Baptist Church. She enjoyed spending time in the mountains, especially when she was with her family. During her free time at home she loved tending to her flowers. When it was time to relax, Mildred sat on her front porch to watch the cars drive by. She adored her grandchildren and great grandchildren. They would light up her world. Mildred will be missed by all who knew and loved her. The family will be receiving friends and family at Faith Baptist Church - Norris, 814 Norris Highway Central, South Carolina 29630 on Thursday, February 7th, 2019 from 1:00 pm to 2:30 pm. The Funeral Service will follow at Faith Baptist Church - Norris 814 Norris Highway Central, South Carolina 29630. Join the family at Faith Baptist Church - Norris Cemetery, 814 Norris Highway, Central immediately following the Funeral Service. To send flowers in memory of Mildred Inez Dodson, please visit our Heartfelt Sympathies Store. 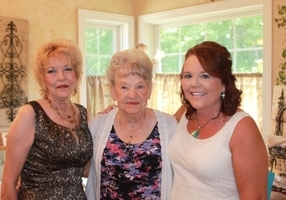 Bonitz - Greenville sent flowers to the family of Mildred Inez Dodson. Our thoughts and prayers are with your family during this difficult time. May you find peace and love in the memories you cherish. 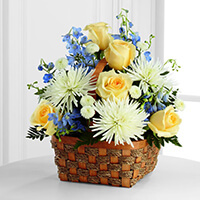 Bonitz - Greenville purchased the The FTD Heavenly Scented Basket for the family of Mildred Dodson. I'd like to express my sincere condolences to you and your family on the loss of your beautiful wife. When you see somebody who has been able to live such a long and full life as Mildred has, one may wonder why man has to die at all. But be assured, God gives us his personal promise found in the Bible at Revelation 21:4, where he tells us that very soon he will do away with death and sickness from the Earth forever, and then he will resurrect Mildred to perfect life here on a fully cleansed Earth, being reunited with family and friends and being able to experience life as God meant it to be, which has always been God's purpose for mankind and for his Earth.